It's been a day of death and tragedy at work today. One of my colleagues told me that an old friend of his had apparently woken up dead over the weekend. I've heard of Sunday morning lie-ins, but that's taking it too far. She wasn't even ill. Sadly the same can't be said for the local Avon lady, who called into the pharmacy this morning to tell me that she'd forgotten to bring the forty quid's worth of stuff I'd ordered for Lisa, but that she'd pop back with it later, after she'd been for a routine doctor's appointment. If I was living in a soap opera, that statement would have been accompanied by some ominous music, followed by an inevitable twist and the EastEnders drums. As it was, I found myself taken by surprise when she returned two hours later in floods of tears, saying that her GP had listened to her description of headaches and slurred speech, given her a thorough examination, and immediately booked her in for an overnight hospital stay, complete with emergency brain scan this afternoon. Fortunately she managed to hand over Lisa's order before she left, but even so, I expect the woman's had better days. Up until then, I thought I'd been having a bad day, but funnily enough, being asked to load forty-one boxes into the back of the pharmacy van in the pouring rain whilst wearing a red NHS jacket that makes me look like Santa Claus, didn't seem quite so bad after hearing about everyone else's morning. I need to start counting my blessings. So on that note, I'd just like to say how thrilled I am with the free pen-holder, keyring and pen given to me this afternoon by a drug company rep in the mistaken belief that I might have some kind of purchasing power in the NHS. The pen's for writing all those cheques. Anyhoo, I like IDIS. 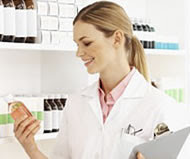 Their website's filled with lovely pictures like this one, accurately illustrating what people who work in pharmacies actually look like. Notice the glasses in her top pocket to imply she's intelligent. Personally I spend most of my days smiling at bottles of medicine with a clipboard in my hand, so I know how she feels. She just needs a blue plastic pen-holder and a bright scarlet jacket, and we'd be like two peas in a pod.